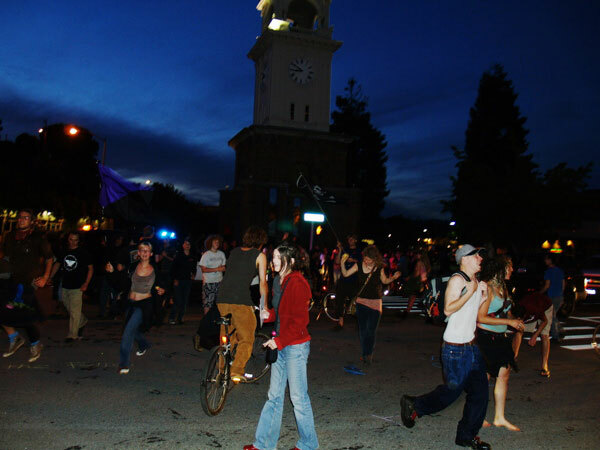 Invitations were distributed to Reclaim The Streets of Santa Cruz on June 3rd with a free street party for everyone. 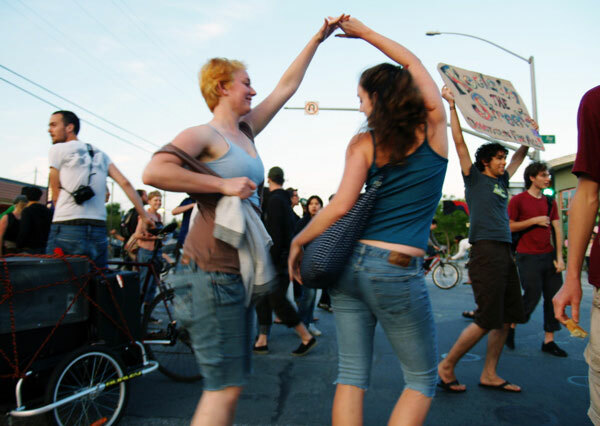 Slowly but surely, musicians, artists, chalkers, dancers, bikers, disc tossers, walkers and other party goers began arriving at Pearl Alley in anticipation of Saturday night's "experiment in spontaneous urban uprising." Free loaves of challah and a jug-band got the party started in Pearl Alley. 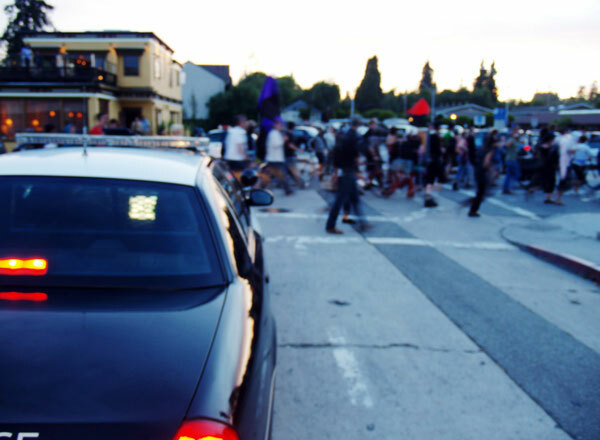 At about 8pm, people drifted into slow-moving traffic on Pacific Avenue to "take over the streets and reclaim community space for community use!" 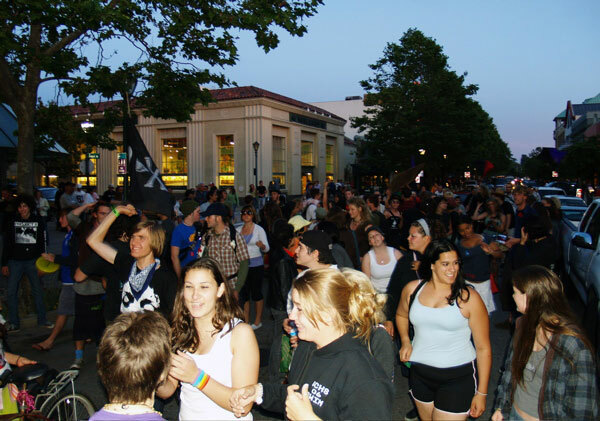 The intersection in front of the Town Clock was briefly reclaimed to demand equality for people of all sexual orientations. 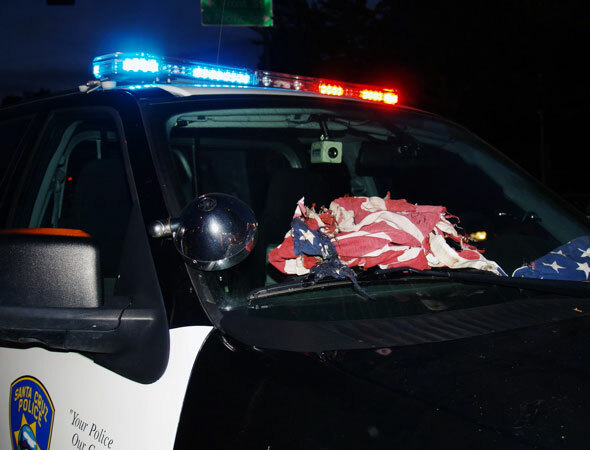 Chalkers drew pictures and wrote "Sin Fronteras" while a couple of partying patriots burned an American flag. 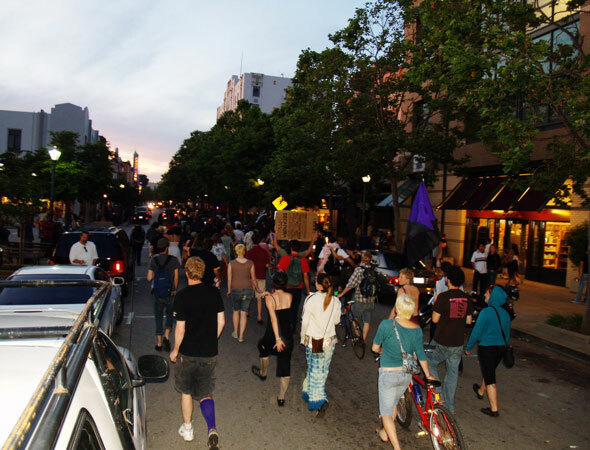 Reclaim The Streets moved away from the Town Clock and back towards the busy stretch of Pacific Avenue. 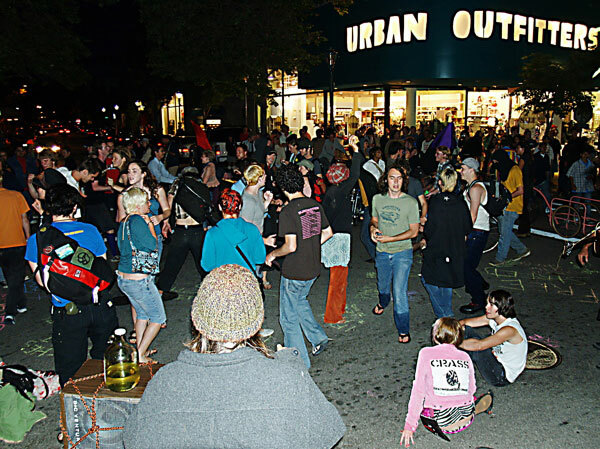 Two couches and the back bench of a van were suddenly brought into the intersection in front of Urban Outfitters while classic hits from Michael Jackson filled the air. 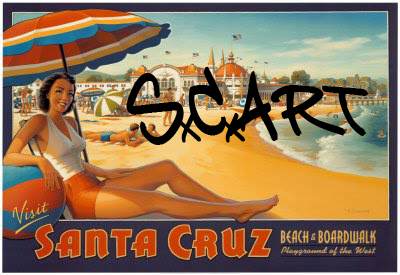 I could hear onlookers saying, "I love Santa Cruz" as they watched people dancing in the streets. However, not everyone was enjoying the "free street party for everyone" and some of the folks who were unable to get down the street in their cars were quite upset with the situation. 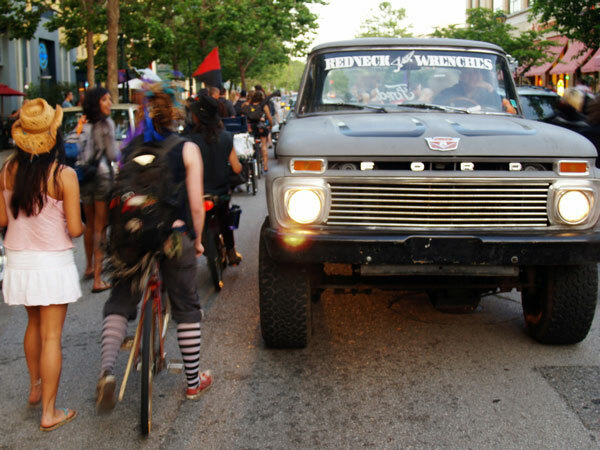 Tensions were eventually diffused at Church and Pacific as the mobile party made it's way towards the Civic Center. 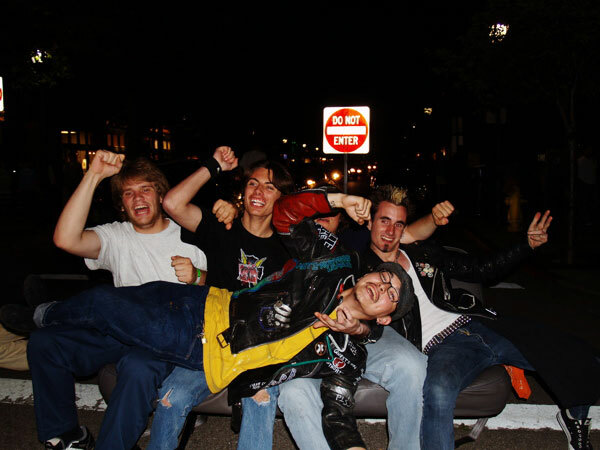 The momentum of the party seemed to be dwindling a bit as people arrived, couches in hand, at the intersection of Church and Center Streets. A driver in a truck decided to disregard the people in the street and drove over a bicycle and bike trailer. The bike trailer was stuck under the truck and dragged with sparks flying from Church and Center all the way to Walnut and Chestnut. At this point, Reclaim The Streets was over and one person was a bit scrapped up after being entangled in his bicycle and dragged for a short period of time along with his bike trailer. A couch and van bench were taken to Good Will and one couch, in good condition, was left on the sidewalk outside the library.